Nick, what was your vision when you and Simone founded Hartmann Consultants ten years ago? 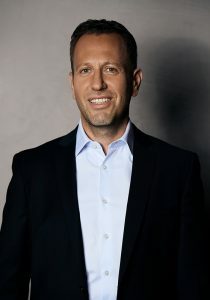 Nick Hartmann: From the outset, our aim was to become the market leader in executive search for the European fashion and lifestyle industries –the leader in search, selection, and evaluation of specialists and executives for the fashion and fashion retail industries, as well as for related industries such as shoes and sports. Why did you initially concentrate on the fashion sector? That was primarily down to the professional experience of Simone, my business partner and my wife. At that time I had spent ten years in HR consultancy, while she had gained a wealth of professional experience at Ralph Lauren, Triumph, and Rena Lange. The fashion industry was a perfect fit for us. It’s quite unusual – and rather charming – to find that Hartmann Consultants are partners in both business and personal terms. What’s it like managing a company with your wife? It’s a challenge, but it’s also wonderful. Of course, we can build on our unshakable mutual trust, and part of our success is down to the fact that we’re completely of the same mind over large-scale decisions. But it’s also a challenge because there are subjects we don’t agree on, as is only natural. It takes a lot of discipline to avoid taking office problems home in the evening. I’d recommend it to anyone, provided they have the necessary resilience. Have you always managed to smile at each other again over breakfast? By the weekend at the latest, yes (laughs). It’s important for us that we both have our own field of operations, our own clients and our own team. It only gets tough when we’re both spending every working day in the office; then the discussions may well spill over into Friday evening. But overall we’ve managed it pretty well. Is fashion still your main focus? Fashion continues to be our core area, including sports and shoes. The lifestyle sector has expanded enormously over the past ten years, so that some of our clients today are in the automotive, food and restaurant industries. What are the most sought-after areas of expertise in the lifestyle sector? Product marketing and building brand values are key issues in many of our assignments. Brands can improve their price category by adopting a brand promise, and this has become an important factor in all industries. Have industries become more permeable, more open to ‘outsiders’? No doubt about it. When I think back to when I started 20 years ago, there were some areas of industry that simply swapped executives around within the sector. People from Nike, say, would automatically head for Puma, Adidas or Asics. Today all areas of industry are far more open to accepting executives from completely different areas. People have recognized that other areas of industry can also be home to valuable expertise that can be important and relevant to their own. Apple is a good example––the computer company that launched an invasion of the cellphone market, and won. This example alone was a huge wake-up call for many people. What role does digitalization play? The numbers of companies that are not tackling digitalization in some form can probably be counted on one hand. However, when we take a closer look at which companies have made progress in this area and how much, we see many retailers are still clearly convinced it’s enough to post a simple website giving their opening hours, address and the brands they sell. As far as they’re concerned, that’s all the digital services they need. But in-depth exploration of the opportunities for cultural change and the overall chances opened up by e-commerce? There’s plenty of scope for improvement. How do you address the topic in your company? Digitalization has always been a major topic for us; our very first large-scale client was vente-privee.com, and that assignment led us to other clients from the field of e-commerce. From Amazon to Zalando, from eBay to Apple, virtually every key online provider has called on our services. From using classic management methods at the outset, we developed into a company where our employees are fully integrated into decision-making processes. Single brain thinking became multi-brain thinking. We’ve always firmly believed in empowering our people, and our objective is for our employees to carve out a position for themselves as consultants with their own client roster and their own status on the market. Projects are structured as joint assignments where decisions are taken by the person with the most expertise, the greatest knowledge in the specialist area––not the person at the top of the hierarchy tree. These procedures are relatively easy to explain to our clients, but establishing them was quite a challenge for us. Let’s talk about executive search. Was business easier or harder in the past? Easier, definitely. When I started 19 years ago, our client had absolutely no interest in regular updates or information, and only wanted to see a line-up of candidates after three months. No interest in what’s we’d been doing in the meantime, in the progress we’d made. Today many of our clients expect daily updates on the progress of their project. They demand complete transparency in our search process, and expect full access to our activities through an interface to our database or an app. Have candidates become more willing to change jobs? No, not at all; quite the opposite, in fact. If you work for a company you perceive as secure, you don’t have much interest in switching employers, because you don’t want to take the risk. However, these days there are very few ‘secure companies’ left. Even big names that have been market leaders for years can suddenly face insolvency or be swallowed up in a merger. There are very few truly secure employers left; and this is just as true of other industries. So how do you convince candidates to make the move? We have to work harder to convince them. Many companies used to simply offer big pay rises, but today clients are often unwilling to pay more. This means that in some cases we can’t offer a rise in pay scale to win candidates round, so we have to focus on aspects like more promising career opportunities, the chance to work with a fantastic brand, or a more modern working environment. Is there anything you can do today that you couldn’t do ten years ago? What areas of expertise do C level candidates need? The ability to define a vision and strategy for a company is still vitally necessary––but the timeframe involved has grown smaller. CEOs can no longer make five-year or even three-year plans; they have to be agile, flexible and able to review their own plans every three months, particularly where technologies are concerned. This is an enormous change. Today’s managing directors and CEOs have to be far more adaptable than in the past. What were your milestones at Hartmann Consultants? After five years in operation we were by far the largest recruitment consultancy in our fashion and lifestyle sector in German-speaking companies, delivering extremely high-level search results in the vast majority of cases. Our new office was a further milestone. We moved here over two years ago as neighbors to key players like Lodenfrey; we’re now in the heart of the city, where all the fashion companies are based. These new premises have enabled us to expand our network of expertise and advance our collaborative working methods.